This device can only work when the ignition key is at MAR. 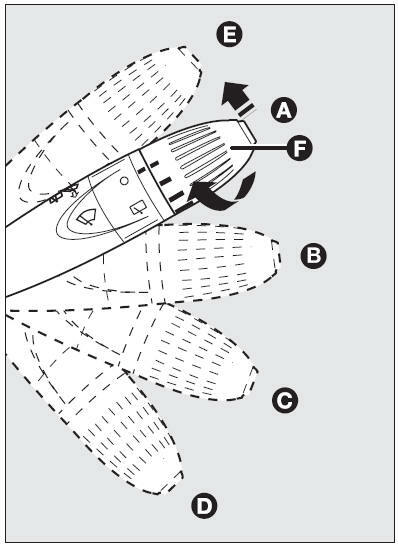 flick wipe: on certain versions, turning the knurled ring (F), four possible intermittent speeds are obtained (slowest to fastest). Operation in position (E) is limited to the time the lever is held in this position. 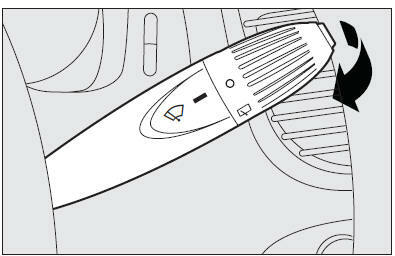 When the lever is released, it returns to position (A) automatically stopping the wiper. Pulling the stalk towards the steering wheel (unstable position) operates the windscreen washer; indeed, the latter comes into action automatically if the stalk is pulled for more than half a second. The wiper stops working three strokes after releasing the stalk. On certain versions a further “cleaning stroke”, after a few seconds, completes the wiping operation. Operating the stalk quickly and repeatedly (for less than half a second) it is possible to wet the windscreen several times without operating the wiper. wiper to remove ice or snow from the windscreen. In these conditions, the wiper is submitted to excessive effort that results in motor protection cutting in and wiper operation inhibition for few seconds as a consequence. If operation is not restored contact Fiat Dealership.